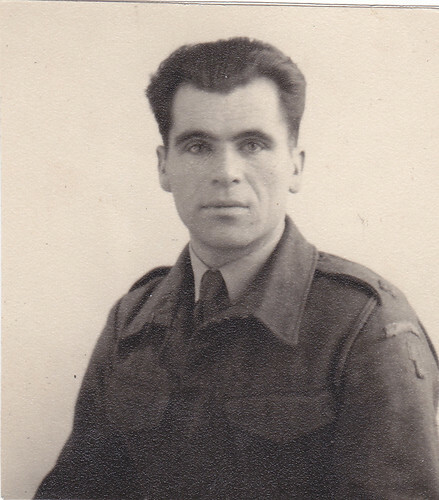 It struck me as I started on my latest blog that – unsurprisingly - I know a lot about my father, and that it might be useful to flesh out a few details for the vast majority of people out there who don’t! 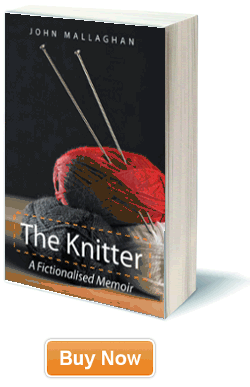 Reading The Knitter will tell you all of course, but even then, since the book is not written as, or structured like, a normal biography, I thought it might be time to offer a short bio of the man without whom The Knitter would not have happened. You know where you can find out more ……. John Mallaghan, know as Johnnie to most that knew him well, was born in 1915 near Holytown, a small working class village in Lanarkshire Scotland, shortly after the start of World War 1. Many of the residents worked in the nearby steelworks and coal mines after the war. Johnnie grew up in a typically large Catholic family of the time, one of seven children. He went to work in the coal mines after leaving school. 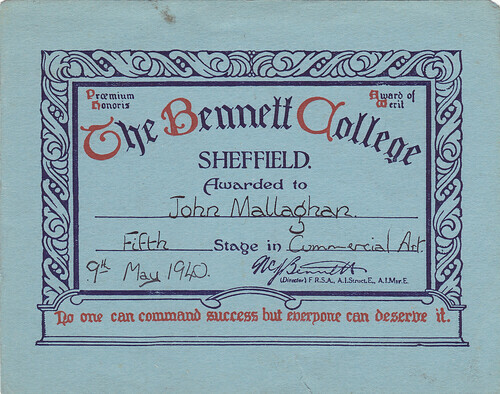 However he also began to show his talent in a broad spectrum of the arts at an early age, and started a 4 year correspondence course in Commercial Art from Bennett College Sheffield, being awarded the equivalent of a modern degree in May 1940. By this time of course, the Second World War had started, during which he served in the Home Guard. During and after the war, he continued to become well known in the local community for his paintings, poetry and musicianship, playing accordion, mouth organ, and piano at parties, weddings, and occasionally semi-professionally at various functions. Some of his best poems were written during the war, particularly the two written especially for the fund-raising effort for the “V-Fund” – “We Didna Forget” and “Why Can’t They Understand”. Interestingly his name was missspelt on the front page, which he would not have liked! Johnnie married Margaret Shaw, from Calderbank – all of two miles away from Holytown – a few years after the war. He had returned to the coalmines, but was determined to make something better of his life and make use of his qualifications. However, the reality of post war life, and the fact that Margaret also came from an even larger Catholic family, made that difficult. He briefly left the mines to take a commercial design job in Glasgow, but a combination of his own concern about his colour blindness, and the birth of the first of his four children, soon saw him back in the coal mines until his eventual retirement in 1970. He continued writing poems, painting wonderful pictures and playing his music right up until his death in 1994. 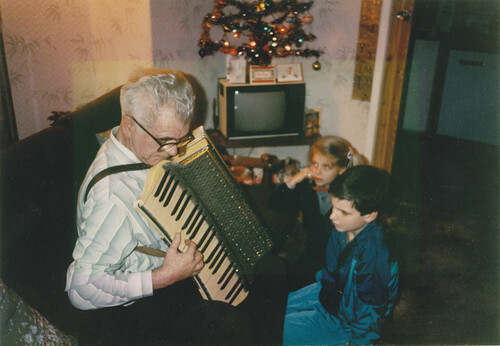 The picture below shows him playing his accordion to two of his grandchildren (the authors two children) around 1985/6. Before he died, his family helped him collect together his poems – or at least those we could find or he could remember – and had him record them on an old cassette recorder, complete with introductions and background, and with each poem interspersed with him playing some music. After this, we arranged to publish them in a limited edition, principally for the extended family. The poems finally have the “world-wide” audience they deserve. I agree with most of your points, but a few need to be discussed further, I will hold a small conversation with my buddies and maybe I will look for you some suggestion later. I envy your work , regards for all the informative articles . As a Novice, I ‘m always searching on the internet for articles or blog posts which might help me. However do you know why i can’t see all the pictures on your webpage? I admire the valuable advice you provide in your content articles. I am going to bookmark your webpage and have my kids check up right here typically. I am very convinced they’ll find out many different new things right here than anybody else! Greetings, this is a genuinely absorbing Internet blog and I’ve cherished learning many of the content and posts contained on the Internet site, keep up the exceptional do the job and wish to read a great deal more stimulating articles in the long term. I’m browsing your websites for that earliest time. I just like the subject material posted right here and ofcource you might be operating difficult for that post top quality..hold the great function up. Bertrand Russell~ Guy requirements for his happiness not just the enjoyment of this or that but hope and enterprise and alter. Youre so cool! I dont suppose Ive learn anything like this before. So nice to find any individual with some unique ideas on this subject. realy thank you for beginning this up. this website is one thing that is wanted on the net, someone with a little originality. useful job for bringing something new to the web! hey , cool post ! where are you from ? There is noticeably a bundle to identify about this. I feel you made some nice points in features also. Korepetycje Francuski Wrocław. Oh my goodness! a tremendous article dude. Thank you Nevertheless I am experiencing subject with ur rss . Don’t know why Unable to subscribe to it. Is there anybody getting similar rss problem? Anybody who knows kindly respond. Please visit our to Download as many Movies as you want and Watch them on any Device with No restrictions! thx. learn more of your helpful info. Thank you for the post.